‘Tis the season to make a little merry–and to say thanks to friends, colleagues, clients and the people who make your life easier all year long. Time to go shopping. 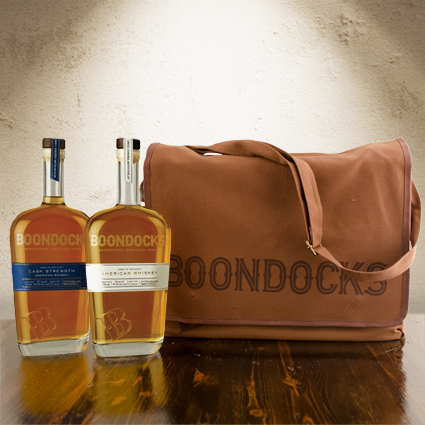 For the connoiseur of fine spirits, a pair Boondocks whiskeys in a sturdy messenger bag would be a most welcome gift. Crafted in close cooperation with Dave Scheurich, one of the world’s most respected master’s distillers and winner of the Whisky Advocate Lifetime Achievement Award, Boondocks American Whiskey is made from a mash of corn, rye, and malted barley. (Don’t call it bourbon–because it’s distilled to a higher proof than bourbon allows.) Aged for 11 years in refilled American oak barrels, it’s available in two versions, a 95 proof bottling and a 127 proof cask strength whiskey–both of which constitute this impressive holiday gift. Boondocks American Whiskey Cask Strength 127 has an ultra-smooth finish, with distinctive aromas of rich caramel and vanilla. At this higher proof, it could be mistaken for a bourbon, with stronger honey and nutty notes. Suggested Retail is $58.